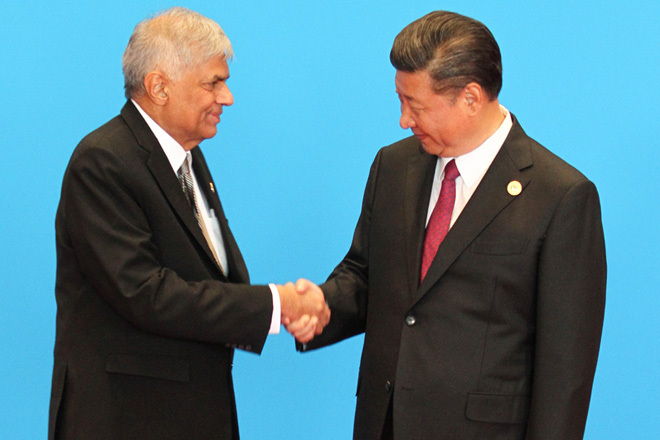 May 16, 2017 (LBO) – Sri Lanka’s Prime Minister Ranil Wickremesinghe says China’s ‘Belt and Road’ initiative complements Sri Lanka’s vision as they share the same synergies. “Sri Lanka plans to use its strategic location and leverage on our connectivity to become the Hub of the Indian Ocean,” Wickremesinghe said. Wickremesinghe said the Government has already commenced the development of the three major ports and the two international airports which are all connected by road and rail to the proposed special Economic Zones. He was speaking at the 2nd session of the leader’s roundtable of the Belt and Road Forum for International Co-operation held yesterday in Beijing, China. Prime Minister Wickremesinghe said Sri Lanka is expanding trade connectivity with EU Journal granting the GSP+ Tariff Concessions. He said the FTA with India is being deepened and also negotiating FTAs with China and Singapore. Prime Minister further stated that the Belt and Road initiative will provide the much needed hard and soft connectivity in the Indian Ocean required for rapid economic and social development. India however skipped China’s Belt and Road Forum following sovereignty concerns over the China-Pakistan Economic Corridor. The Belt and Road initiative is the first economic cooperation arrangement connecting the Eurasian continents. This initiative is proposed by President Xi Jinping and China is providing the initial funding.